There has been a rash of crime in recent months. The importance of having a good hostage negotiator has never been more critical to the department. That is where YOU come in. In this follow-up to the acclaimed Hostage Negotiator solitaire game, this standalone expansion can serve as a fully playable introduction or expand upon existing content. With its unique tension filled game play, you will feel the pressure as you try to save the hostages and end the crisis. 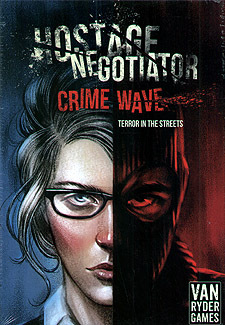 Hostage Negotiator: Crime Wave comes with new Conversation cards, Terror cards, larger dice, new hostage pieces, and more! Plus, the larger sized box is built to contain all of the current Hostage Negotiator content with additional room for future expansions!